In Europe combination guns and double rifles are relatively popular, partly because of their practicality, but also in part because of restrictions on firearms ownership in certain countries. In Europe there can also be a certain amount of cultural “just isn’t done” thinking. For example, years back I was working in an office where there was another keen shooter. He was British, an ex British Army officer who was a tad deaf because his job during the Cold War was to launch Honest John missiles. He was a lovely guy and a nicely eccentric Brit. There came a day when I’d been gun shopping and shared with him that I’d just purchased a Remington 870. He looked at me with aghast horror and declared “Not a pump action!” Apparently a British gentleman just doesn’t own something as un-genteel as a pump action shotgun, it “just isn’t done”. Suffice to say I enjoyed my ownership of the Remington 870 despite being regarded as a bit of a Philistine, and the ducks taste just as good whether shot with a pump action 12gauge or a Purdey side by side. Three guns in one neat case. 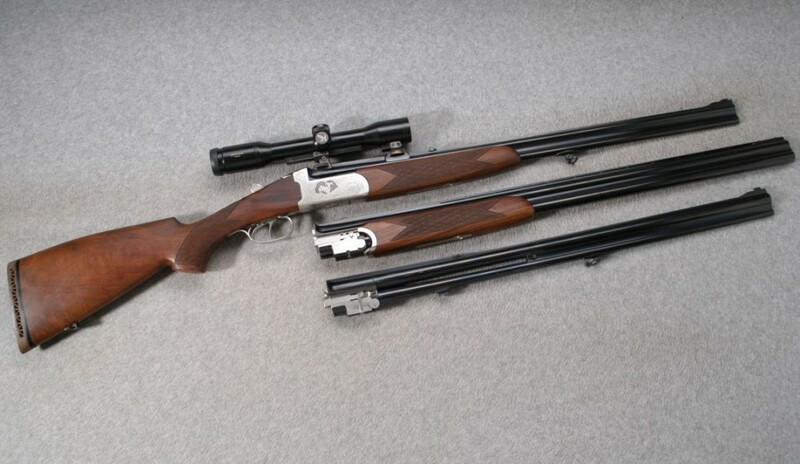 All of which brings us to this nice looking Antonio Zoli combination gun set. 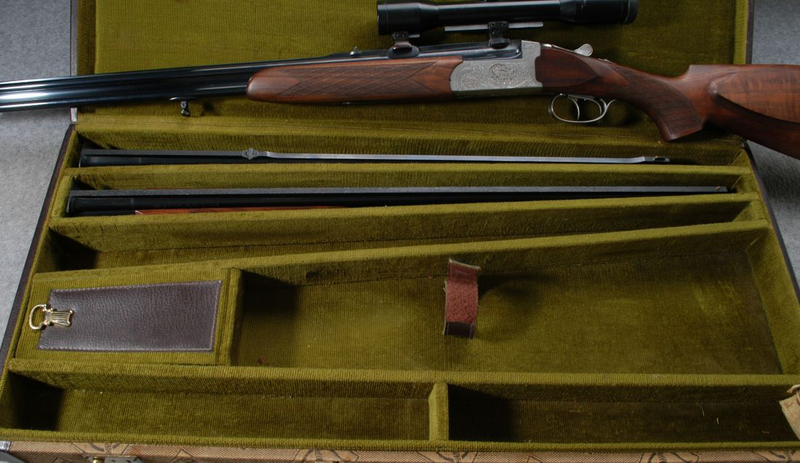 This set is for sale on Cabela’s Gun Library and it provides three guns in one neat carry case. The set comes with 25½” 30/06 double rifle barrels complete with a Swarovski Nova 4x32mm rifle-scope in quick detachable claw mounts, a 25½” 20gauge over a .243 Winchester barrel combination, and 28″ 20gauge double shotgun barrels. So there is a 30/06 double rifle which will nicely serve for most deer hunting needs, a 20gauge over and under shotgun for bird shooting etc. and the interesting 20gauge over a .243 Winchester barrel, which I can imagine being useful for fox whistling, the rifle barrel for a wary fox who is reluctant to approach the whistle, and the shotgun barrel for the fox who boldly comes in close. You will find the Cabela’s sale page for this set if you click here. It looks like the 20gauge over .243 Winchester barrels are not set up for optical sight mounts yet, only an open sight, but a competent gunsmith should be able to remedy that if desired. The simplest and cheapest way to accomplish that may be to machine dovetails into the express rib and use quick detachable double lever rings. Consultation with a gunsmith is recommended. A conventional rifle-scope may not be the best choice for this barrel set depending on how the owner wants to use it. Swarovski rifle-scopes are amongst the best in the world and the 4x32mm is a good general purpose hunting scope. The rifle-scope is in European style claw mounts attached by a rail. 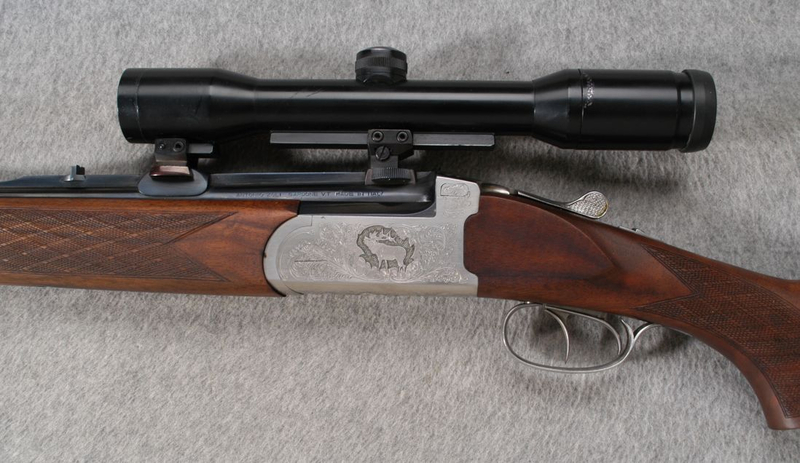 The 30/06 double rifle barrels have an express rib with an open rear sight, and a Swarovski 4x32mm rifle-scope with an integral rail mounted in Suhler type claw mounts. Suhler claw mounts allow removal of the rifle-scope and return to zero on re-fitting. So this double rifle can be conveniently used either with the rifle scope or with the open sights as desired. 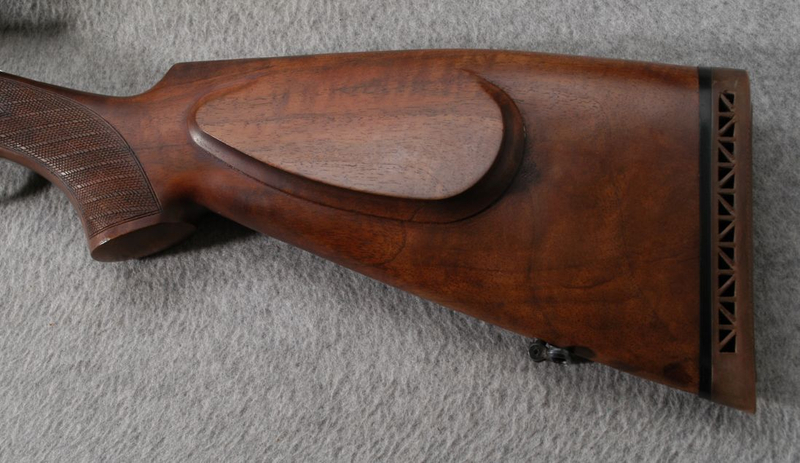 Stock style is of the “hogs back” style with a continental pancake cheek-piece. 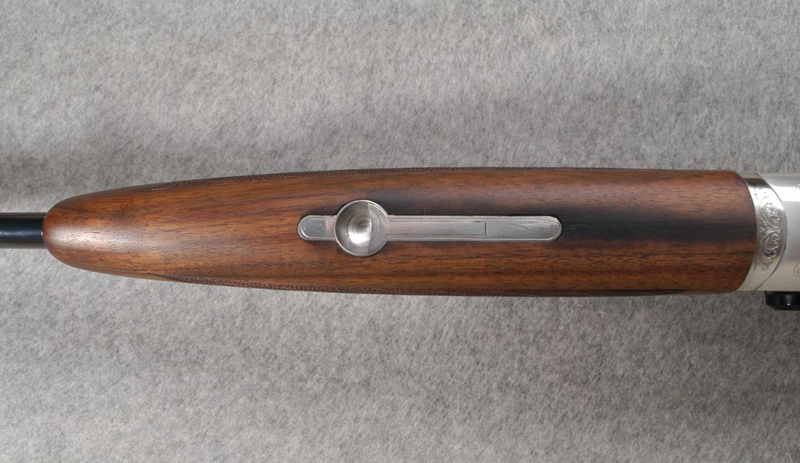 The fore-end is graceful yet full enough for comfort, and the set comes with two fore-ends, one for use with the 30/06 double rifle barrels, and the other for use with the 20gauge shotgun and 20gauge over .243 Winchester barrels. 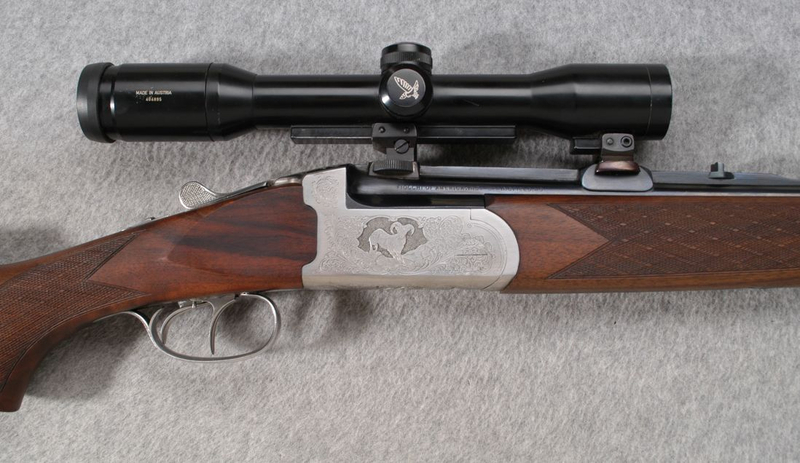 The engraving on the action is of a wild sheep on the right side of the action, a stag on the left side of the action, and a stag on the underside. 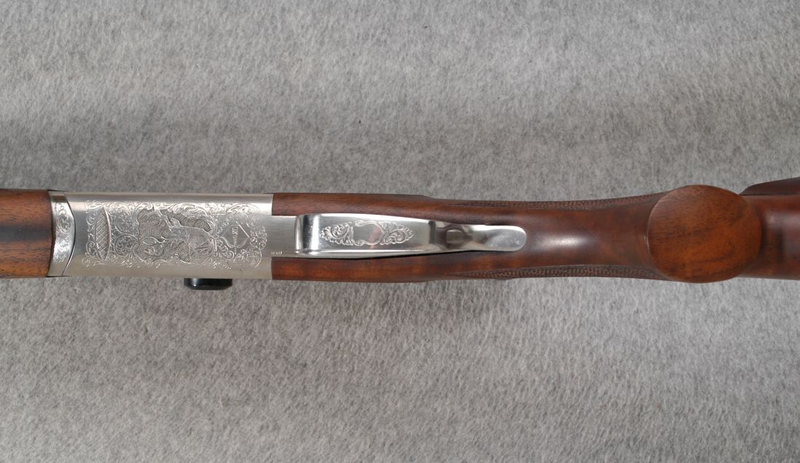 Engraving on this gun is nicely done. Here we see the stag decorating the left side of the action. The double triggers enable an easier way to instantly choose between barrels. All in all this is an attractive set and it is priced at USD$7839.98 at time of writing. Coming as it does in a fitted case this is a set that could be taken in the back of the Land Rover or whatever 4WD you have and you’ll be equipped for most hunting situations you are likely to encounter. The 20gauge shotgun barrels also being suitable for clay target shooting. So if you are looking for something that has the multi-purpose abilities of this set all in a convenient modest size carry case this could be just the gun for you.